Recently graduated from Southern Baptist Theological Seminary and struggling with his first pastorate, Edgar Young Mullins vented his frustration in a letter to his seminary classmate, E. M. Poteat. 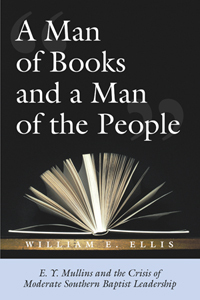 “Why,” Mullins inquired, “can [a pastor] not be a man of book and a man of the people both?” In continuing commitment to learning and to ministry, Mullins personified the dilemma of many a “moderate” Southern Baptist and other American evangelicals. As a minister of Baptist churches from 1885 to 1899, Mullins grappled with anti-intellectualism and poverty, intellectual complacency and affluence. As president of Southern Baptist Theological Seminary from 1899 until his death in 1928, Mullins steered his “moderate” course between the “modernists” of Chicago and the “fundamentalists” of Fort Worth, endeavoring in his own scholarly work to synthesize evangelical supernaturalism with modern philosophy and science. While he never abandoned belief in supernaturalism as a necessary foundation for Christian witness, Mullins was attracted to the Pragmatism of William James and was willing to accept a “Christian theistic evolution” that put God in charge of the process Darwin had postulated. By the 1920s, however, no “middle ground” remained beneath the theological tightrope that Mullins had walked so successfully for so long. Even as he led Southern Seminary through a period of unprecedented expansion and built the campus that is an outstanding legacy to Southern Baptists, Mullins found himself assailed on the right by militant fundamentalist and abandoned on the left by modernist: neither of the warring factions could any longer tolerate “moderate” evangelicalism. His failure to achieve a synthesis that would mollify both fundamentalists and modernist and bring them together was due to the diversity within the Southern Baptist Convention, the growing strength of the fundamentalist faction, the theological intransigence of the several parties, and Mullins’s own conservatism. Perhaps, as William E. Ellis argues, in a detailed and careful study, “the effort was doomed from the start.” While Mullins achieved great success as a theologian, administrator, and denominational leader, Professor Ellis tells us, “he was unable to break the hold of Southern culture on his denomination.” William E. Ellis is a professor of history at Eastern Kentucky State University in Richmond, Kentucky. After studying for degrees at Georgetown College and Eastern Kentucky University, he completed doctoral work in American intellectual history at the University of Kentucky.